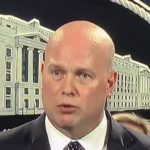 When the Democratic-controlled House Judiciary Committee asked Donald Trump’s illegitimate Acting Attorney General Matt Whitaker to publicly testify about his role in Trump’s obstruction of justice antics, Whitaker quickly announced that he’d be happy to oblige. The Democrats correctly smelled BS, and lined up a subpoena for Whitaker just in case he refuses to show up tomorrow, or refuses to answer important questions. Now Whitaker is, predictably, playing games. Palmer Report first sensed that something was off this morning when the Department of Justice leaked a story to the media about Matt Whitaker prepping really hard for his testimony. It was a zero-impact story, but the leak itself suggested that Whitaker and his allies in the DOJ were already trying (and failing) to establish some kind of false narrative about his upcoming testimony. Sure enough, Matthew Whitaker is now saying he’ll refuse to show up and answer questions tomorrow unless the Democrats promise him in advance that he won’t be served the subpoena. This makes no sense, of course, considering that the entire point of the subpoena would be to ensure that he shows up and answers questions. It’s now clear that Matt Whitaker is scared to death about tomorrow’s testimony, and he’s floating feeble nonsense to try to get out of it. Has anyone at the DOJ explained to Whitaker what contempt of Congress is? The Democrats can have him arrested tomorrow if he blows off the subpoena and doesn’t show. We’ll see what happens, but this smells as bad as one of Whitaker’s scam toilets.